The Quantum III DC drive from Nidec/Control Techniques delivers a DC drive package that integrates the intelligence of the Mentor II DC Drive with a space saving design that incorporates many accessories typically required in manufacturing applications. 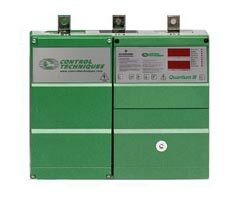 Quantum III DC drives are ready to install and run DC motors. Like the Mentor II, they are easily configurable to control motor speed, voltage or current using standard internal settings. The simple addition of the MD29 applications card enables users to incorporate custom or proprietary process control application programs to their drive. The Quantum III also provides extensive communication protocol options. With added features like a DC loop contactor, high-speed input fuses and 115 VAC control logic, provision to accept AC/DC tachometer feedback and DC output fuse on all regenerative models, the Quantum III saves engineering time and panel space that makes it ideal for any drive application. Find Price and Availability on any Nidec/Control Techniques Quantum III Drive part by clicking on the Buy It Now button. If cannot find what you are looking for, call our Customer Support team at 1-866-599-6516 or email at sales@cimtecautomation.com.